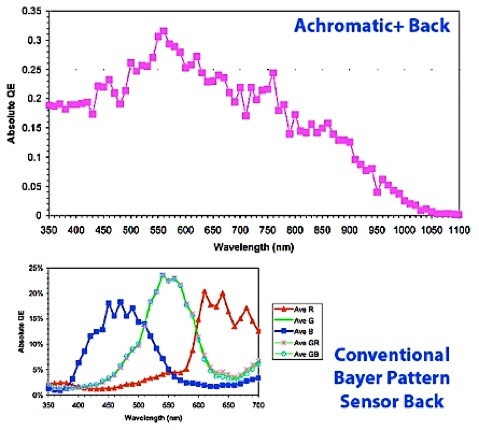 The Achromatic+ back is an extremely precise and sensitive digital imaging instrument. It is capable of full spectrum imaging and extended range UV & IR as well. Isolation of the desired wavelength range is as simple as filtering for it. Reaching well beyond the visible spectrum, the Achromatic+ records un-interpolated data which is virtually free of any foreign artifacts or image anomalies. 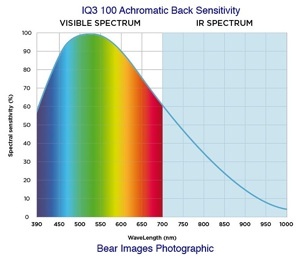 As you can see in the chart to the right, Quantum Efficiency of the sensor in the Achromatic+ back is expanded beyond the visible spectrum to include ultraviolet and infrared wavelengths. This expanded sensitivity is the result of the lack of Bayer Pattern color filters and IR cut-off filters on the Achromatic+ digital back. This lack of filtration also contributes to the capture of the most accurate data, increased sharpness and foreign artifacts are virtually nonexistent.